Mission Control on the Charles, the Pats and Sox in the Seaport, an Urban Ring light rail, and other failed projects that could have changed Boston as we know it. Boston’s cityscape would be different had these projects come to life. From the earliest days on the Shawmut Peninsula, Boston has been a city of creation and reinvention — filled in, developed, burned down, bulldozed, and redeveloped. Once the crazy quilt of docks and streets was established on the clenched fist of land jutting into Boston Harbor, engineers cut down hills and brought in gravel to produce the foundation for the 19th-century grids of the Back Bay and the South End. In the 20th century, urban renewal scraped many landscapes clean, effectively starting the city-building process all over again, from Government Center and the West End to the New York Streets area in the South End, where superblocks cleared in the 1950s are now being re-seeded with condo complexes such as Ink Block. By the turn of the millennium, the ultimate public works project, the Big Dig, had transformed the metropolis. Today Boston is booming in new areas, from the Seaport to Dorchester and Roxbury, Allston to East Boston. Yet for every execution of big plans, other proposals remain unbuilt. Many would have altered the city’s trajectory dramatically, while others may yet be possible. “There are no simple explanations to why some imaginative and well-intended plans have not been executed in Boston,” says Lawrence A. Chan, principal at Chan Architecture & Urban Design, who has worked on projects across the city, from the Rose Fitzgerald Kennedy Greenway to City Hall Plaza, that could have turned out differently. The unexecuted projects — faded drawings on tracing paper rolled up in pigeonholes, or renderings stored away on slide decks that have not been opened for many years — range from the quixotic to the perennial. The impulse to create land has been consistent: Consider St. Botolph’s Island, proposed in 1907 as a man-made expanse plopped down in the Charles River between the Longfellow and Harvard (Massachusetts Avenue) bridges. A subsequent plan looked to connect the Boston and Cambridge park systems by adding islands at the current Museum of Science. Then there was The Floating City, a series of geometric platforms extending out over the water from Columbia Point in Dorchester to Thompson Island as part of an envisioned bid for the 1976 World Expo, to be converted to a new neighborhood for nearly 50,000 people afterward. Unbuilt Boston also includes dashed dreams of building ever upward, with at least a half-dozen skyscraper blueprints that never became reality (though Don Chiofaro’s Harbor Garage tower may still fight its way through). A Harvard art museum never rose on the banks of the Charles River in Cambridge; developers have not been successful at transforming most of the air rights along the Massachusetts Turnpike; the North-South Rail Link and the Red Line-Blue Line connector, from Bowdoin Street to Charles/MGH station, still haven’t been bored. Read on for five dramatic examples of the Boston that never was. Boston would have had a mini Interstate 95 if the 1948 Master Highway Plan had been realized. Every day, commuters pass remnants of a Boston highway that never was: a truncated offramp on the southbound side of the elevated Interstate 93 in Somerville and the Massachusetts Avenue connector and Melnea Cass Boulevard at Newmarket, south of downtown. Those were the beginnings of the Inner Belt circumferential highway (Interstate 695), envisioned after the turn of the 20th century and crystallized in the 1948 Master Highway Plan for the Boston Metropolitan Area submitted by public works commissioner William Buracker, and modified and implemented by his successor, William Callahan. The route was set to run through Roxbury, the Fens, and a piece of Brookline, across the Charles River at the Boston University Bridge, and on through Cambridge and Somerville, as a kind of tighter version of Route 128, closer in to the urban core. In addition, two new highways were to be spokes radiating out from the hub of the planned Inner Belt: the Northwest Expressway, branching off to today’s Route 2; and the Southwest Expressway, running from the current sharp turn at Interstate 95 and Route 128 in Canton all the way up through Hyde Park and Jamaica Plain. Citizen opposition and environmental challenges convinced Governor Francis Sargent to cancel the entire bundle of concrete, steel, and asphalt in 1970. Hundreds of homes had already been demolished, mostly in Forest Hills and Roxbury, and the multilane Melnea Cass was opened in 1981 in a sweeping arc that echoes the envisioned beltway. But the failed plans morphed into other elements that most Bostonians probably don’t know the origins of, including the Southwest Corridor Park from the South End to Forest Hills, and the Orange Line to Back Bay Station. 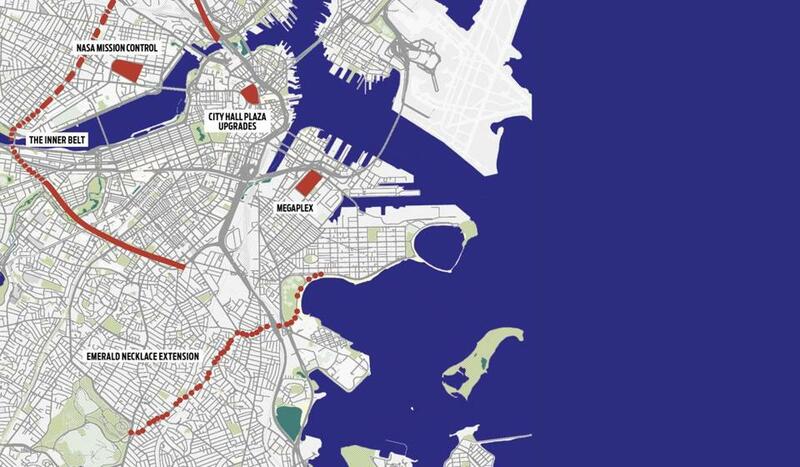 The turmoil over the potential highway building sparked the Boston Transportation Planning Review, a fresh start that called for major transit improvements (arguably teeing up the Big Dig). The Inner Belt also offered an excellent blueprint for what would have been a new circumferential transit service, the Urban Ring — light rail or bus rapid transit that largely followed the path of the proposed highway beginning at Melnea Cass, to the BU Bridge, and on along an existing freight track through Cambridge. A transit version of the Inner Belt has been talked about for four decades, but the Urban Ring itself remains part of unbuilt Boston. Apollo 13 astronauts could have said, “Cambridge, we have a problem.” During the administration of President John F. Kennedy, the area around the current Boston Marriott Cambridge hotel in Kendall Square was under consideration as the site for the Manned Spacecraft Center for the fledgling NASA program. 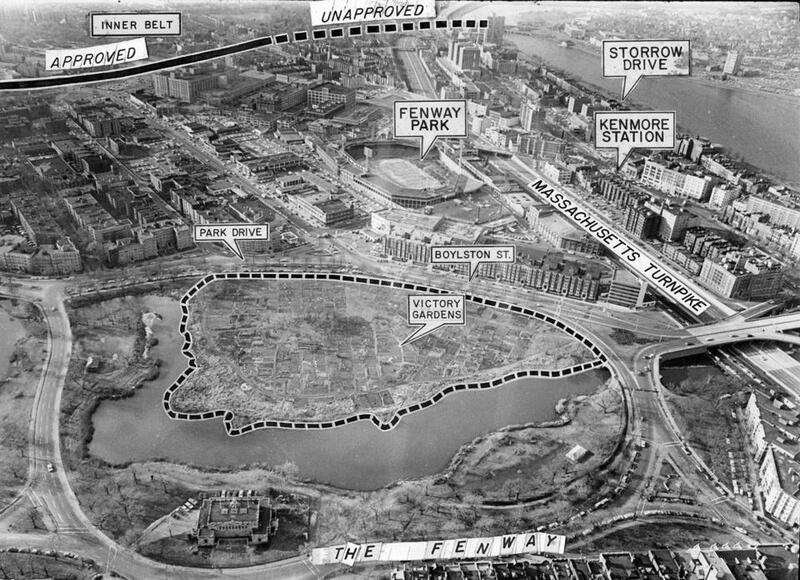 The training and operations complex would have occupied several parcels cleared under the same urban renewal policies used across the river in Boston’s West End. 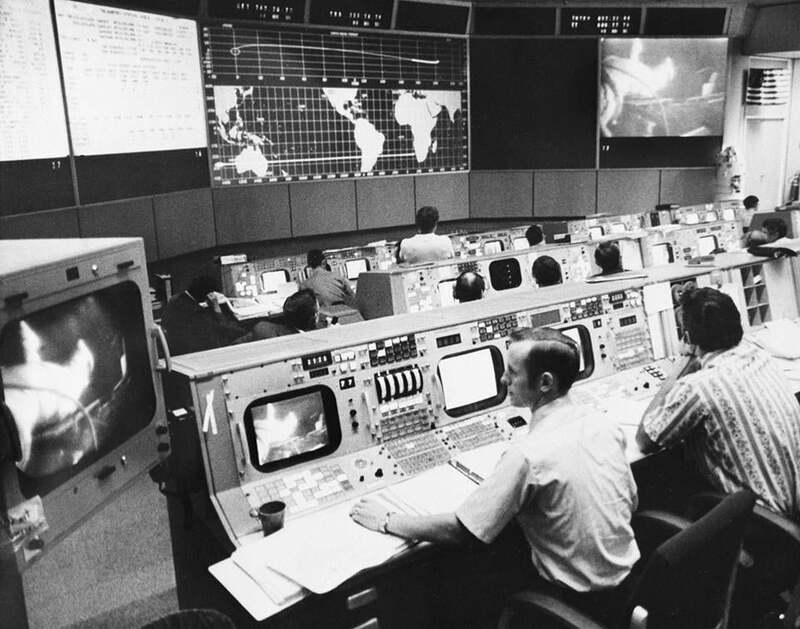 But for reasons including weather, other sites were considered and, ultimately, Houston — which just so happened to be in Vice President Lyndon Johnson’s home state of Texas — was chosen, in tandem with launch operations at Cape Canaveral, Florida. Perhaps as consolation, Kendall Square was selected as the site for a major center on electronics research, where nearly 1,000 employees worked on microwave and laser technology and other wizardry. That facility ultimately closed, but the mini-campus of buildings was reimagined to become the US Department of Transportation’s Volpe Center. Many of the other urban renewal parcels remained vacant until the Kendall Square tech boom started gearing up. It’s hard to know how or if a NASA complex would have formed a confluence with Google and Microsoft. Could the area be more vibrant with ideas and innovation than it is today? A telling footnote is that MIT has agreed to redevelop the Volpe transportation center and adjacent parcels between Broadway, Binney Street, and white-hot Third Street into a mix of residential and commercial properties, perhaps including a 50-story tower. Frederick Law Olmsted’s Emerald Necklace is more like an unclasped string of pearls. It begins at Boston Common and the Public Garden, runs down Commonwealth Avenue in the Back Bay, through the Fens, and on through Brookline and Jamaica Plain. The world-famous 7-mile-long park system, begun in 1878, terminates at Franklin Park at the confluence of Jamaica Plain, Roxbury, and Dorchester. Olmsted planned on making it a real necklace, with a greenway running up Columbia Road from Franklin Park toward what is now Moakley Park, Day Boulevard, and Carson Beach in South Boston. The “Dorchesterway” would have been a tree-lined “pleasureway” similar to the Riverway, Jamaicaway, and Arborway. It is safe to say that the corresponding real estate development would have had a different character in that section of town — perhaps more like the residential Back Bay around the Commonwealth Avenue mall. Diehard Olmsted fans have long hoped his vision would be fully executed, and plans were dusted off during Boston’s fledgling 2024 Olympics bid. The cost of planning and design was estimated at $17 million. 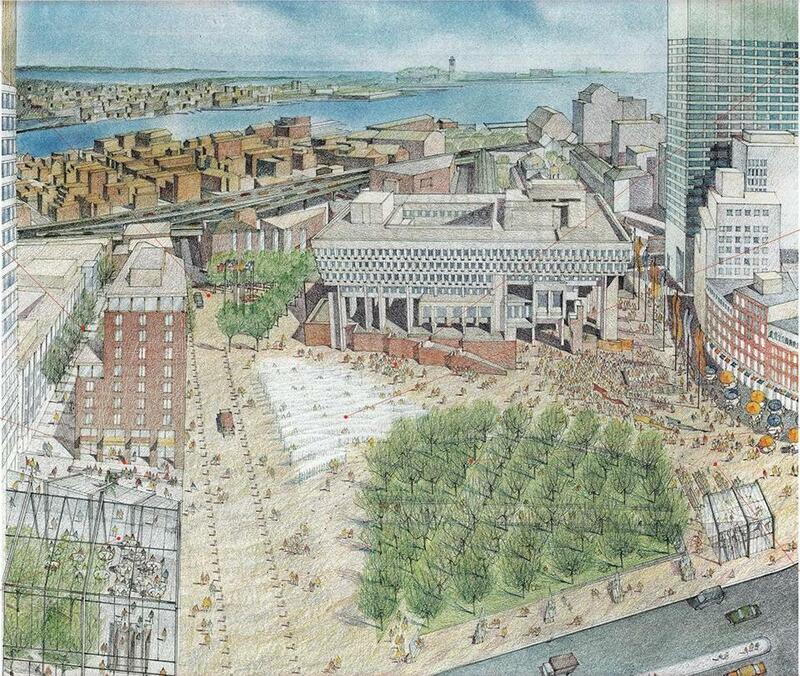 City Hall Plaza has never lived up to its artists’ renderings. This 1998 plan would have restored historic Hanover Street, created an urban green and interactive fountain, and put a hotel next to the plaza. Government Center and Charles River Park may be the urban renewal projects that many Bostonians wish had never been built. Most of the West End neighborhood and Scollay Square were razed to make way for Boston City Hall, the John F. Kennedy Federal Building, and brutalist architect Paul Rudolph’s Government Service Center, plus the Government Center garage. Perhaps the biggest misstep has been City Hall Plaza, modeled after an Italian piazza but in reality a windswept and barren open space in the heart of downtown. A parade of proposals to reinvent City Hall Plaza has come and gone over the years, including plans for a hotel, underground garage, and reconfigured public spaces. An arcade lining Cambridge Street helped define the edge of the plaza, and the new Government Center MBTA station headhouse has lent greater heft and identity to the area. One idea never realized was uncovering and restoring Hanover Street from Congress to Cambridge streets; the ghostly avenue is preserved under the bricks of the plaza near the federal office complex. Nor is there a pedestrian bridge above Congress Street between the plaza at the south approach to City Hall and the doorstep of Faneuil Hall, in part due to concerns it would conflict with the area’s historic character. Then-Mayor Thomas M. Menino briefly pushed for a relocation of City Hall to the Seaport, blithely suggesting that the Le Corbusier-inspired seat of city government — built in 1968 by Kallmann, McKinnell & Knowles, devotees of the Swiss-born pioneer of modernism — could be turned into a great handball court. The interim solution has been to fill City Hall Plaza with programming, whether the speechifying stage for duck boat parades celebrating sports victories, the Enchanted Village, the Big Apple Circus, or the seasonal beer garden, creamery, and mini-golf course situated in the brick-paved environment of mid-century modernism. The 1990s was an era full of promise for all of Boston, and visions of new sports venues generated drama. The vaunted Megaplex, championed by then-Governor Bill Weld, was to be a sports arena and convention center all in one. Patriots owner Robert Kraft sought to relocate the franchise from Foxborough to an in-town stadium, along D Street in the Seaport. Then-House speaker Thomas Finneran and Jimmy Kelly, a South Boston city councilor, had other ideas. Frank McCourt, owner of exquisitely positioned land off Northern Avenue in the Seaport, proposed a new Red Sox stadium before parlaying his valuable holdings to buy the Los Angeles Dodgers. Red Sox team ownership bemoaned their outdated 1912 ballpark in the Fenway and floated building a new baseball stadium, essentially re-created brick by brick next door, framed by Boylston Street and Brookline Avenue. None of this ever materialized, although Kraft still wants a new soccer stadium in Boston. Mayor Martin J. Walsh has touted city-owned land, including the infamous tow lot next to the Southeast Expressway in Southie. Today, the Seaport is home to multimillion-dollar condos, commercial office space, hotels, Rafael Vinoly’s convention center, and fabulous restaurants and bars; it would have been even more lively — and congested — if the Patriots and the Red Sox played there. The Patriots ended up in an ever-expanding complex in Foxborough, 21 miles southwest of Boston. Fenway Park remains the oldest major league ballpark, now fully renovated and expanded, in a neighborhood with soaring residential towers and many more fabulous restaurants and bars. The old Boston Garden on Causeway Street was replaced on site, and residential and commercial development is surging in the area known as the Bulfinch Triangle. All the Boston sports teams stayed put — and everything old is new again. Anthony Flint is a senior fellow at the Lincoln Institute of Land Policy, a think tank based in Cambridge. Send comments to magazine@globe.com. Get the best of the magazine’s award-winning stories and features right in your e-mail inbox every Sunday. Sign up here. This story has been updated to clarify that it would cost $17 million for the planning and design phase of completing Frederick Law Olmsted’s original vision for the Emerald Necklace, and to note that William Buracker was public works commissioner in 1948.